What’s Your Next Big Decision? Excerpt from How Leaders Decide, the #1 new historical reference book on Amazon. Every day, in enterprises large and small, leaders like you face issues that can make or break their organization and reputation because of a decision they will make—including the decision to do nothing. Leadership is under the microscope, particularly in today’s divisive, politically charged environment. Leadership has never been more important, and decision-making has rarely mattered more. While every person makes hundreds of decisions every day, leaders distinguish themselves in their decision-making: the stakes are almost always higher, the number of people affected by their decisions greater, and the responsibility to make the decision is theirs alone. To be a leader, you must make decisions. Sound decision-making is driven by our core values and reinforced by our experiences. Yet leaders don’t always make the right decision. At the front end of most choices, it’s impossible to know all of the things that will happen as a result of a single decision. And so leaders are compelled to decide without fully knowing the consequences of their choices. Decision-making comes with the territory. Successful leaders learn from a bad decision and make a better decision the next time. Exceptional leaders make more good decisions than others when the stakes are the highest. When you consider the biggest decisions you’ve made, what did you learn about yourself? The ultimate responsibility for the success or failure of your team, department, or organization is in your hands. People are counting on you to put them in a position to succeed. How do you establish a framework for ethical decision-making? How do you communicate and instill this framework throughout your organization so it becomes second nature? How do you ensure the decisions you make will yield the results you expect? What do you do if you make a bad decision? How do you respond to controversy, crises, and setbacks? 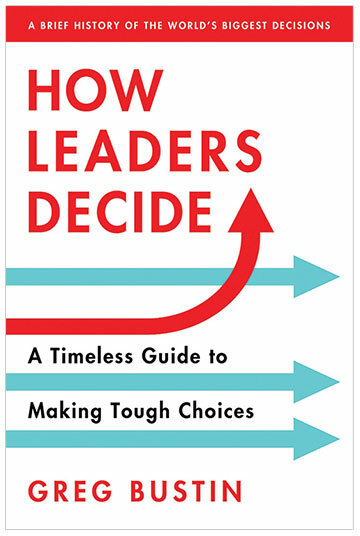 The leaders you will meet in How Leaders Decide: A Timeless Guide to Making Tough Choices wrestled with these types of questions. The decisions made by influential figures—from Alfred Nobel and Marie Curie to Winston Churchill and The Beatles—during turning points have shaped history’s trajectory, and now their decisions can inspire you and help you make the decisions that will determine the direction of your organization. These insightful, stirring stories prompt today’s leaders to reflect on their own situation as they seek to replicate the actions of men and women who made a courageous decision in the face of difficult circumstances and changed history. It’s as if today’s leaders are saying to themselves, If ordinary people placed in extraordinary circumstances can summon the wisdom and courage to make a tough decision, perhaps I can channel their experience and energy to make a tough decision in the circumstances I’m facing. In researching stories for my new book, I’ve combed through more than twenty-five thousand events to uncover little-known or oft-obscured circumstances where, in each case, a leader faced a decision that, once made, reverberated around their world—if not the entire world. I identified the key decision a leader made that ultimately led to triumph or tragedy. In many instances, it’s likely you know about the event or person, but you may be less familiar with the context surrounding the decision. It’s less likely you’ve paused to consider the implication of that decision from the perspective of what’s happening today in your world. The book is not a collection of anniversary dates. So the April 15, 1912 sinking ofTitanic is not the focus, but rather the decision made twenty-seven months earlier by Bruce Ismay, managing director of the White Star Line (the company that commissioned Titanic), to enlarge the ship’s grand staircase. This decision meant each bulkhead of the sixteen watertight compartments was lowered so that when Titanic collided with the iceberg, the forward compartments were flooded within 160 minutes, sinking a ship that many considered unsinkable. There’s no single silver bullet for making difficult decisions. In my work with leaders (and in my own consulting practice), I recog­nize that leaders often make the tough decisions when the pain of not making them becomes greater than the pain of making them. The point for all of us is that it is the decision to decide that matters. What’s your next big decision? How will you decide? Once the decision has been made, leaders encounter obstacles that test their commitment and discipline to execute their decision and achieve the outcome they envision. Making the decision is worth nothing without executing it.